Pranayama – The practice of purposefully controlling or regulating your breath. Benefits: Settles the mind and body in preparation to practice yoga. Dirga (pronounced “deerga”) – A form of pranayama, this three-part breath involves inhaling into your lower belly (with your right hand on your belly), then into your diaphragm or midsection of the lungs, and finally into the chest (with your left hand on your chest) – and reversing this flow when you exhale. Benefits: Helps increase oxygen to the heart and lung to counteract shallow breathing – which can occur with depression or anxiety, frequent sitting and poor posture. Cat/cow – A pair of simple poses done on your hands and knees. For “cow,” inhale as your belly drops and your gaze rises, and for “cat,” exhale as your spine rounds and your chin comes to your chest. Benefits: This flow brings awareness and energy to the entire length of the body while also creating flexibility in the spine. 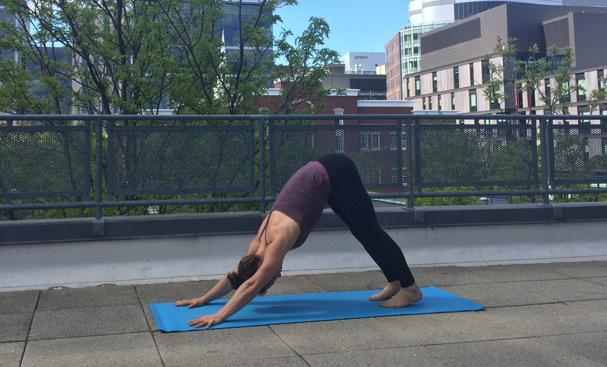 Downward dog, or “downdog” – Another simple pose, done on your hands and feet, that involves the entire body and lengthens the back from head to foot as you bend at the waist. Benefits: It’s gently energizing and balancing for the mind and body. Sun salutation A, or “sun A” – One of the easiest and most common sequences in yoga, which can be done at any pace to be more or less energizing. It involves reaching upward toward the sky, then folding forward to touch your shins or the floor, stepping back into a plank pose, lowering your body to the floor, then pressing up with your arms and chest into a “cobra” pose, and finally, returning to a tabletop (hands and knees) and a “downdog” bend – repeating the sequence as needed. Benefits: Gets blood flowing and builds energy during your yoga practice. Locust – Laying face-down and raising your chest, arms, lower legs and feet off the floor. 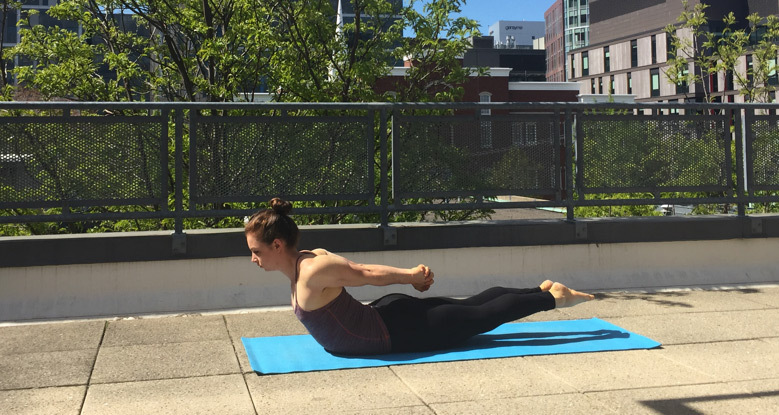 Variations include keeping your arms at your sides and hands reaching straight back (think: “Superman” style) or interlacing your hands behind your lower back for even more of a stretch. Benefits: Helps open the chest to combat poor posture or slumped shoulders, which can come from feeling withdrawn or physically closed off – common symptoms of depression. Plow – A back stretch that involves laying on your back and reaching your legs and feet overhead, touching your toes to the floor above your head. Benefits: It quiets the nervous system, relieves irritability and serves as a full body renewal. 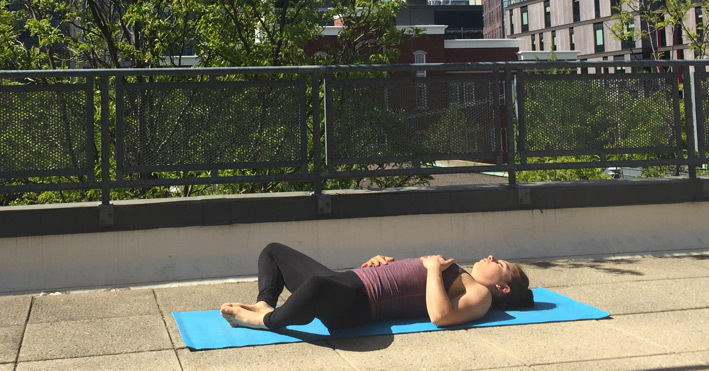 Supine bound angle pose – A hip-opening pose where you lay on your back with your feet together and knees apart (think: “butterfly” style). Keeping your hands on your chest and belly helps you focus on breathing and relaxation. Benefits: This restorative pose can relax the mind and body. More than 15 million Americans practice yoga, and there’s increasing evidence of yoga’s physical and psychological benefits. New research published in Psychological Medicine is the largest study of the yoga/depression connection to date. The study involved 122 adults with moderate depression. Half of them were randomly assigned to try hatha yoga (most forms of yoga practiced in the West), while continuing treatment with anti-depressant medication. After 10 weeks, the yoga group didn’t show significant improvement over the “control” group, but after six months, 51 percent of those who took yoga (about three sessions per week) experienced a 50 percent reduction in symptoms (compared with a 31 percent decrease in symptoms in the non-yoga group). The takeaway? Yoga may not alleviate depression symptoms right away, but the benefits may build when yoga is practiced regularly over a longer term. Hundreds of patients report using more than a dozen different forms of yoga as part of their treatment plan. See how patients with major depressive disorder are using yoga and how they rate its effectiveness.